After more than 15 years’ experience in competitive BBQ cooking, we have achieved the perfect barbeque sauce; our special Sweet Sauce O’Mine. We have combined several different flavors and have managed to perfect it with just the right amount of sweet and just enough heat to create a sauce that is perfect on all types of meat and veggies too. You can have this tasty sauce whether you are in a competition or just cooking at home. Sweet Sauce O’Mine is just good for everything! 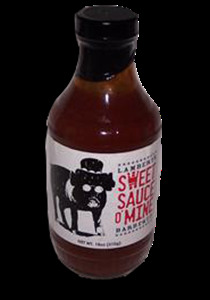 If you want that added zest to your dish, get our Sweet Sauce O’Mine original BBQ sauce today! This 18 oz. size will be great for a family get together!